Some time ago I posted a quick review of the Lowepro Pro Runner 450AW, which you can read here, since then I have experimented with quite a few more camera bags and due to the insane popularity of that last post I’ve decided to do more bag reviews. 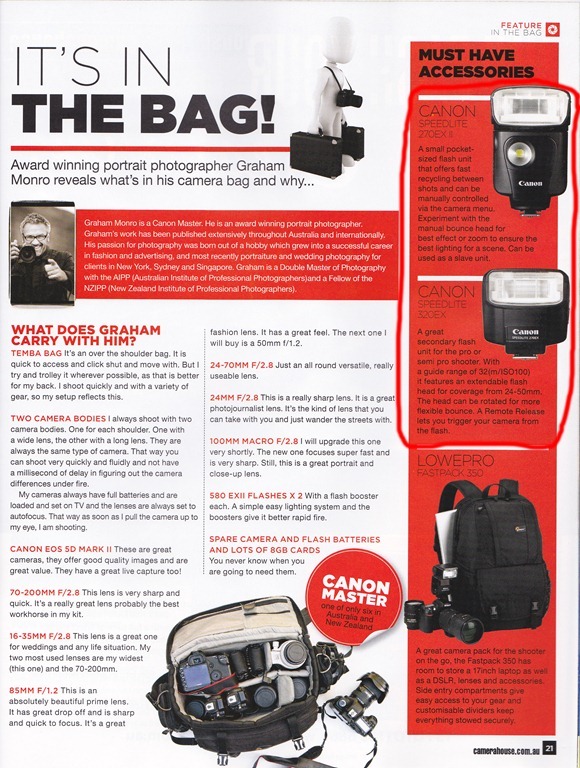 So here it is, another camera bag review by a photographer for photographers. I present the Lowepro Photosport 200AW. This bag was designed by Lowepro to suit the more active photographers and those who like to combine physical activity with their love of photography. I would highly recommend this bag for cyclists, trekkers, and climbers to name a few. The video below sums it up extremely well. The thing you’ll notice immediately about this bag is the way it looks. It’s a great looking camera bag that doesn’t look like a camera bag at all. If anything it looks like a trekking bag, or something I would take snowboarding (which I did). Lowepro offers this bag in two colours, black and orange. I went with the black mostly because I didn’t want to stick out too much when walking around the city, though the orange still appeals to me and would be my choice for hiking/climbing/snowboarding for visibility reasons. A quick run down of the features of this bag. Lowepro logo aside, pretty inconspicuous as a camera bag which is great for traveling. You can see I’ve also managed to use the bottom straps to clip my tripod in place (Benro C2692). The zipped pockets on the waist strap are great for holding things like coins and quick release plates. The back is padded just enough to keep the bag fairly comfortable when carrying heavy loads over a long distance, I have had no issues with weight in this bag. In the side view you can see I can still squeeze a water bottle on the right. The camera compartment is a side access much like the Fastpacks which is great for getting your camera in and out on the run without taking the bag off both shoulders. 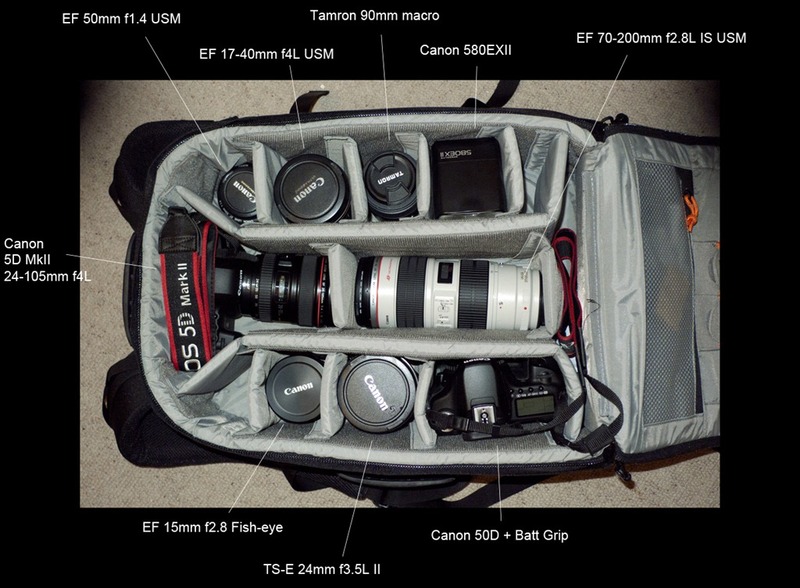 My only issue with this bag is that it doesn’t actually carry much camera gear in the padded compartment. In the photo I’ve managed to put my Canon EOS 5D MkII with EF 24-70mm f2.8L attached with a reversed hood. In the side I also have a second lens. This compartment is too small for a pro body like the 1DX or D4, or any body with a battery grip, so certain sacrifices will have to be made. I’ll only briefly speak about the ‘Ultra Cinch camera chamber’ as I hardly use it, it is only useful if your gear flops around a bit while it’s in the bag. If your gear only just fits in the compartment, then leave that tucked away (like I have) and it’ll save you a bit of time when accessing your equipment. At this point the bag carries pretty much everything I need for a day of shooting. My Canon 580EXII is also in the top compartment somewhere. There’s a photo of the bag emptied out, as you can see there’s quite a bit of gear in there (again, OM-D isn’t in photo). Looking at that, most enthusiasts would be satisfied with that setup to handle just about anything that can happen on a day of shooting. All in all, I absolutely love the bag, it looks great and is comfortable when I carry as much or as little gear as I want (the above setup weighs in at about 7kg, tripod is about 1.7kg). For me, the bag gets an 8/10, my only issue is the lack of space in the camera compartment but not everyone will want to carry the amount of gear that I do. All that aside, this is still the perfect bag for an active photographer who needs a lightweight, comfortable bag to carry a mixed bag of goodies. A minor issue, one side of the top carry strap actually ripped off while I was out on location (slightly annoying), but since I don’t use it a whole lot I elected to cut it off all together. Not a huge concern, and it didn’t make me think any less of the bag, only the first time any Lowepro bag has done that on me. The bag sells for about $149USD on B&H. If you are local in Sydney, Australia, check out Castle Hill Camera House which is where I get a lot of my gear from, the friendly staff are always happy to help and talk photography as well as great local prices (Castle Hill Camera House did not pay me to write that, despite what it sounds like). Some of you will know, one of the many things I do is working at Camera House. It’s great since I get a first hand look at all the new gear that comes in as well as any new product announcements. Camera House recognises that this is a luxury that not everybody has, in their response they release catalogues (almost monthly) as well as their own free magazine every few months or so (available at any Camera House or online here). Personally I think it’s a great idea, it provides the average consumer with a bit more insight into the industry as well as being decent reading material while on my lunch break. The one thing that particularly bothers me with these magazines and catalogues, is that there are ALWAYS mistakes, some understandable, others downright stupid. Don’t get me wrong, I’m not hating, I just wished there weren’t so many mistakes in a magazine provided by one of the largest camera retailers in Australia. 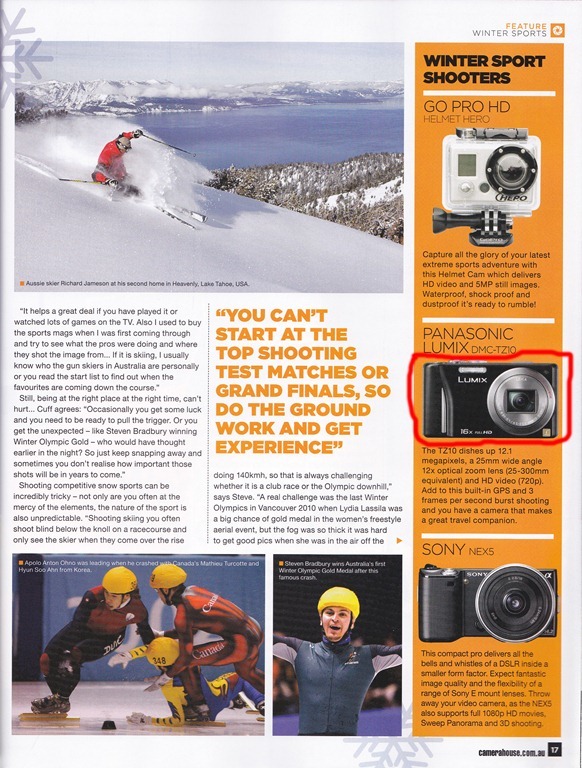 Example #1: Nice little write up on the Panasonic TZ10, which they’re trying to clear out. A slightly longer glance at the photo will tell you that it is in fact a photo of the TZ20. TZ10 has a noticeably different hand grip. Under must have accessories, it talks about 2 Canon external flashes, 270EX II and the 320EX. Another photo mistake, they have a photo of the 320EX in the 270EX II section and vice versa. Nice work. 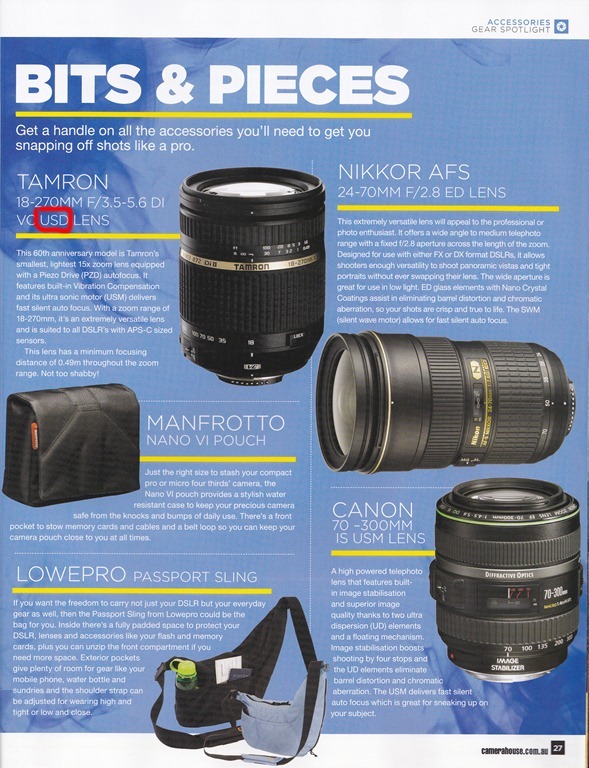 Finally we feature the much loved Tamron SP AF 90mm f2.8 macro which I also own. It was the 3rd lens I’ve ever owned, the first was a Tamron 17-50 f2.8, 2nd was Canon 55-250 IS (both of which have been sold). Sad to say, the editors have managed to butcher this one as well. 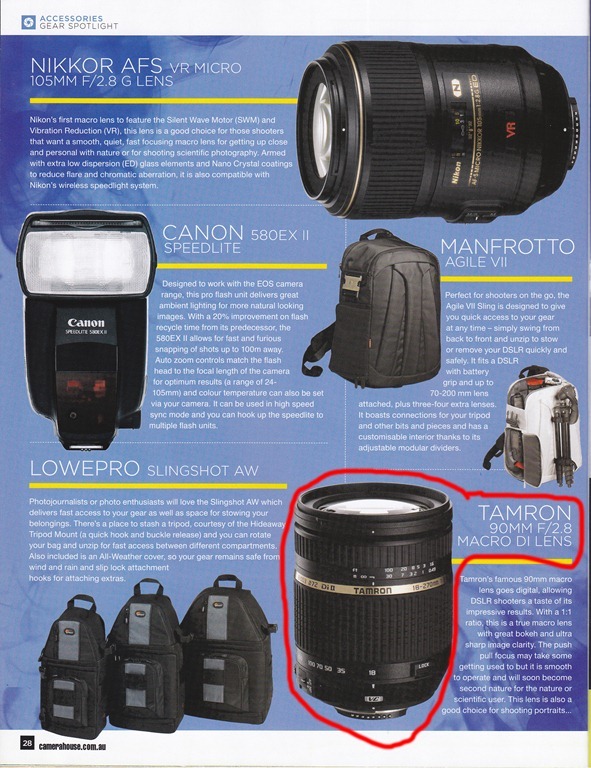 Nice little write up on the lens, but instead of putting up a photo of the 90mm macro, they put up a photo of the previously mentioned 18-270 PZD. Not sure how well you can see that, but if you click on the image it should enlarge. Apparently at DCC during their EOFY sale, they expect us to pay more for certain memory cards. That actually doesn’t bother me so much, what bothers me is that they made it seem as if we’re getting a bargain. Hmm, I’m sure it’s just a mistake, but that’s why you should always read carefully when it comes to online shopping. p.s. My external hard drive had an unfortunate accident, there’ll soon be a post about the emotions of losing 30000+ photos and trying to get them back. p.p.s. Also expect a few more Lowepro camera bag reviews, I’ve recently purchased a Stealth Reporter D200AW, and have a Photo Sport 200AW on order. Those will hopefully be as popular as my Pro Runner 450AW review. p.p.p.s. As always, comment and share the love. p.p.p.p.s. If somebody from Camera House head office is reading this, no offence, but I could be your guy. 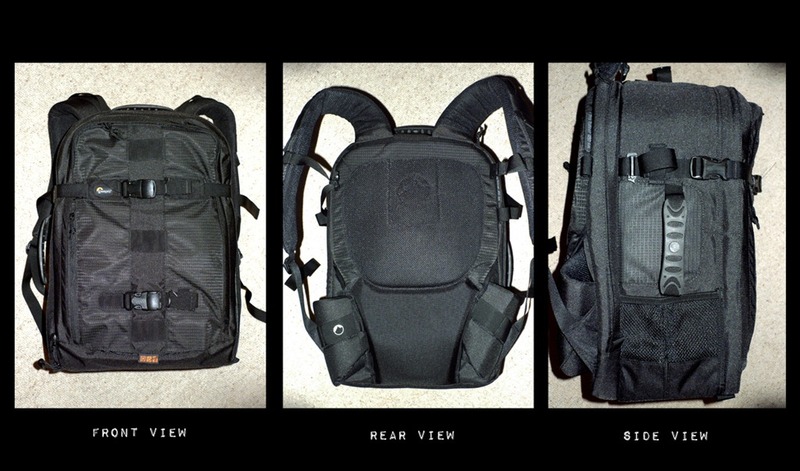 For the last couple of weeks I’ve been looking at getting a new camera bag to replace my Lowepro Flipside 400AW. The Flipside is a great bag, but ever since I bought a couple of new lenses it got a bit cramped. I needed the new camera bag to be able to carry EVERYTHING, all my camera gear and a laptop as well as filters and chargers for when I’m travelling. The other important thing was it needed to be cabin compatible for carry-on luggage in international flights. All those bags fit the criteria, but based on info gathered from the Lowepro site as well as nearly every forum out there, I decided to get the Pro Runner 450AW. 12.2W x 6.7D x 18.5H in. 13.4W x 11.4D x 19.9H in. As you can see, the bag is one of the more low profile bags in the list. The bag isn’t huge, it’s about the same size as the Kata Bumblebee and a bit bigger than the Lowepro Classified 250AW (which I also use). One thing you will notice straight away though, is the immense depth of the bag (more obvious when you see the internal photos). From the front there isn’t much going on, nice and simple with a couple of sliplocks for the tripod carrier. The waist straps can be hidden away into the back of the bag, which I love since I rarely use those straps and they tend to get in the way in large crowds. You can see one of the handles on the side view (also one on the top) for easy movement in and out of storage compartments. There is also a laptop compartment to fit a 17in Macbook Pro, my Alienware M11x fits in there quite easily. In a quick arrangement of the interior padding (completely customisable), you can see this bag has plenty of room for gear. There are still a couple of spaces that I haven’t use up, and I could have easily added another gripped body onto the end of the 70-200. This bag is designed to hold Pro bodies or gripped bodies, measuring roughly 6.5in deep in the gear compartment. A nice touch is the shoulder strap supports which keep the bag as close to your back as possible (this is important when you carry so much gear). You can also see the tripod holder, and the hidden compartment for the all weather cover. With all the camera gear inside it, the bag weighed in at about 10-11kg, but as soon as you put it on your back you can hardly feel the weight. I would gladly go trekking with a full load in this bag for a whole day. If the zippers used in this bag was the same as those used in the Vertex 200AW it would easily rank as one of the best bags that Lowepro have ever made, but you can’t have it all for such a low price. Overall, 9/10, I’d recommend it to anyone who needs to transport a large amount of gear for holidays/photoshoots/day-trips.